Gutenberg could never have imagined this, but you have the opportunity on your NOOK Tablet to adjust the text size and screen brightness, customizing the feel of the book to your personal preferences. This menu, for reasons known only to the designers at B&N, has a different look and feel than most of the other options screens in the tablet. Never mind, though; it’s pretty easy to use. 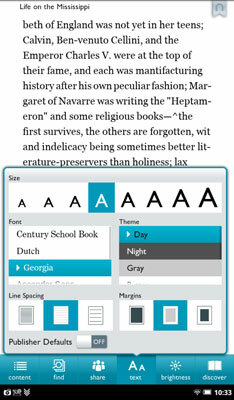 In most EPUB books, and in many PDFs, you can choose from eight type sizes. You just see eight A characters. Start out at the fifth or sixth largest for a good balance between readability and number of words that fit on the page. Feel free to experiment, though; touching any of the A’s will instantly change the size of the type that still shows above the menu. Day. This is your basic black text against white background. Night. You guessed this: white type against a black or gray background. This may be useful for reading at night or in other dark environments where you don’t want to light up the room with your book. Gray. Black text on a light gray background. It isn’t a bad occasional choice to rest your weary eyes. Butter. A slight variation on day, using dark brown text against a pale yellow page. Mocha. White text against a light brown backdrop. Sepia. Black text against a yellow-brown page. You can adjust the amount of space between lines of text: single spacing, 1.5-line spacing, and double spacing, shown from left to right onscreen. Experiment here between narrow, medium, and wide margins for the text. The more white space there is around the text, the fewer words will fit on each line. Maybe you want to leave all of the decisionmaking to a professional graphic designer. Drag the switch to On to use the formatting recommended by the publisher; you’ll see the selections on the menu, but all other options will be grayed out and unavailable. Brightness refers to the illumination of the LCD screen. Tap the Brightness button and then drag the slider to the right to increase the light level; drag it to the left to decrease it. A less-bright screen may be more comfortable on your eyes in certain conditions, and a dimmer illumination will use less battery power. Tap outside of the brightness slider to close the menu.